You'll be £25.00 closer to your next £10.00 credit when you purchase Borneo Boys. What's this? Order within the next 2 hours, 29 minutes to get your order processed the next working day! For nearly four years in the 1960s, British and Commonwealth armed forces were embroiled in conflict on the island of Borneo. Its difficult terrain and lack of adequate road networks proved to be one of the biggest challenges from a military perspective, a challenge met in great part by the mobility of the helicopter. The story of the 'Borneo Boys' of the title, traces a journey from new recruits at boot camp, to flying training and on to Borneo itself. It was here that a fraternal bond was to be forged to last a lifetime and serve as an impetus for this book. The process of theatre familiarisation – jungle training, nursing Whirlwind 10s over and around the mountainous Malayan jungle – is recorded here with first-hand authenticity. Setting this journey in context, the author fills out the history of the wider conflict. The Far East colonial tensions which bred antagonism and ultimately led to the conflict are detailed, as are the cross-border raids and riots which bred a fever of revolt. Indonesian 'Confrontation' arose as Malaysia struggled towards nationhood against a background of simmering colonial tensions. The focus of this book is on the young men who were called upon to fly over such confusion, far away from home, and we witness their daily adventures, learning trajectories and camaraderie. All the excitement of the aviator's adrenaline ride is translated into elegant prose, strengthened by the kind of confident delivery achievable only by a man who was himself involved in the action. It is indeed a refreshing change to read about the experiences of those who flew the lesser known helicopters in this relatively unknown theatre... Previously unseen snapshots taken by the pilots adds to their accounts, giving a human element and understanding to this book... Borneo Boys is a fascinating read, set at a good pace, is well presented and clear. A marvel of aviation history as well as an important account of post-colonial upheaval in that region of South East Asia. The use of personal photographs brings the stories of the pilots to life - 'Borneo Boys' is, after all, a tribute to them. Clearly written, it documents the day-today life of pilots serving in Borneo with confidence and style. Superb book. Superbly supplemented with many fine photographs and maps. Highly recommended. An impressive collection of 'I was there' stories. There is much hard data embedded within and between these tales and the reader will be able to derive a great deal of information relating to the Army and RN, as well as the RAF, units involved. For the reviewer it was the personal accounts that brought the book to life. Each contribution would make a good 'Boy's Own Story' in its own right but being brought together, and supported by an excellent on of well-reproduced photographs, they illustrate a story that could be bettered only by an action movie. Such a movie would have to be in 3D in order to capture the often hair-raising close-ups of 200ft trees, the stomach churning drops into hastily prepared LZs and the aerobatic manoeuvres required to get into and out of some sites, often a dozen times a day. lifting supplies from DZs to camps, or constructional materials to hill-top first and relay stations together with the regular redeployment of Army units and their howitzers. This could involve logging an impressive 37 hours in a two-week detachment - and that was just he routine flying! Add to this the rapid-reaction insertion of troops to counter incursions and many service and civilian casevacs and one has the flavour of the task facing the Borneo Boys. Pen & Sword are to be congratulated on publishing this well-presented, well-illustrated hardback, as is the author on his easy to read style. I recommend this title and especially to anyone who was involved in 'Confrontation' or who may be studying the application of Air Power. Terrorist, rebels, border conflicts, dubious alliances – sounds like everyday modern news. This book revisits a long forgotten conflict from 50 years ago. For once, it turned out well. From basic training to pilot qualification, we follow the young recruits into the pressure cooker that is combat duty and would forge them into brothers in arms, the Borneo Boys. Engagingly written… honest, suitably illustrated with many unpublished photos. This 306-page hardback delivers a detailed, engaging and at times very amusing account of RAF Westland Whirlwind operations during the Indonesian confrontation. Based on first-hand accounts, it makes for compelling reading, while the author has been careful to set the carefully researched stories into the wider context of regional conflict and RAF helicopter operations. Those whose stories are told have also contributed photographs from their private collections and the majority of the more than 120 images spread through the book are in colour. This book sheds new light on one of the UK’s often overlooked wars and the early years of helicopter operations. A vivid account of the events of the Indonesia/Malaysia confrontation 1962-66. A fascinating book to have for those with a passion for helicopter flying and general aviation. For nearly four years in the 1960's, British and Commonwealth armed forces were embroiled in conflict on the island of Borneo. Its difficult terrain and lack of adequate road networks proved to be one of the biggest challenges from a military and logistical perspective.. a challenge met in great part by the mobility of the helicopter. The story of the titular Borneo Boys traces a journey from new recruits at boot camp, to flying training and on to Borneo itself. It was here that lifetime fraternal bonds were forged and serve as an impetus for this book. The process of theatre familiarisation - jungle training, nursing whirlwind 10s over and around the mountainous Malayan jungle - is recorded here with vivid first hand authenticity. Setting this journey in context, the author fills out the history of the wider conflict. The far east colonial tensions, which bred antagonism and ultimately led to the conflict, are detailed, as are the cross-border raids and riots which bred the fever of revolt. Indonesian 'Confrontation' arose as Malaysia struggled towards nationhood against a background of simmering colonial tensions. The focus of this book is on the young men who were called upon to fly over such confusion, far away home, and we witness their daily adventures, learning trajectories and camaraderie. All the excitement of the military aviator's adrenaline ride is translated into elegant prose, strengthened by the kind of confident delivery achievable only by a man who was himself involved in the action. A truly remarkable read about a little known conflict. 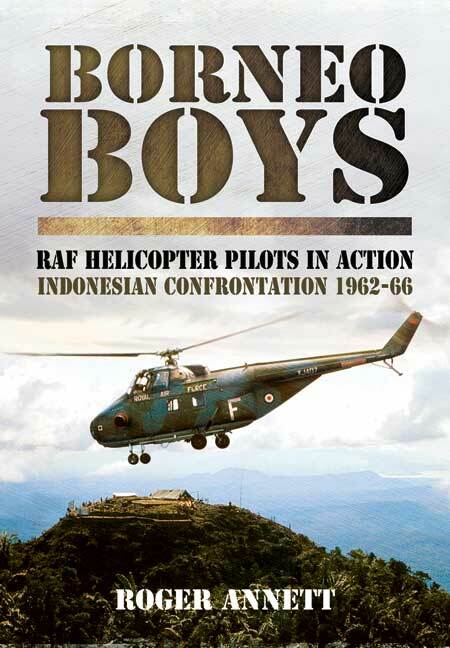 I have read Borneo Boys cover to cover and really enjoyed the detailed insight into such a fascinating part of our Squadron history, brought so alive by the personal recollections of the participants, particularly as I knew some of the characters myself as simulator instructors. I am also now fascinated to know what happened to Whirlwind on Tinkar Hill. It’s a shame we live in such a limited resource world, otherwise a Squadron expedition to climb Tinkar Hill and find out would have been on the cards! This book is an honest account of the “Confrontation”, which in reality was no less a conflict than any other hot war. Roger Annett has done a sterling job and is uniquely positioned to explore this topic, himself having served in the conflict on fixed wing aircraft. The author's first hand experience and understanding makes the book easy to read and informative, giving the historical political context surrounding the confrontation, as well as information on the mixed type of aircraft that could by found operating in the area by the Royal Air Force, Royal Navy and the Army. Borneo Boys is a fascinating read, set at a good pace. It is well presented and clear. A marvel of aviation history as well as an important account of post-colonial upheaval in that region of South East Asia. The author served during the Confrontation as a pilot with Transport Command (see Drop Zone Borneo, which is also published by Pen & Sword). He has used this personal experience and has allied it to a commendable degree of extra research to produce a book which gives the reader a real feel for the period. He has interviewed 24 veterans of the campaign and intersperses the narrative of the developing picture as a whole with many fascinating personal memories. The reader sees the world through their eyes, which really brings a sense of realism and immediacy to the story, which is told by the author in a relaxed but authoritative style. The historical, political and military background is sketched in succinctly, as also are the technical details of the helicopters central to the story, the Westland Whirlwind Mk 10 and the Bristol Belvedere. The text is complemented by a marvellous selection of hitherto unpublished photographs, culled from old albums tucked away in the lofts of these 24 ‘Old Rotors’. This is an excellent book which I thoroughly recommend as a very good read and also an important piece of aviation history. Flew with 215 Squadron, co-piloting Argosy transport aircraft deep over jungle terrain from 1963 to 65. He served with the RAF from 1962 to 1967 before joining the computer industry. He lives in Buckinghamshire and has various articles published in Industrial and local magazines.